Several dozen people seeking asylum in Sweden refused to leave their bus when they found out that they would be living in a tiny town. They demanded to be brought back to a big city, and police refused to evict them from the vehicle. The incident happened in Grytan, a småort in central Sweden. The term refers to a small rural community of 50 to 199 residents where houses are built close enough to each other. 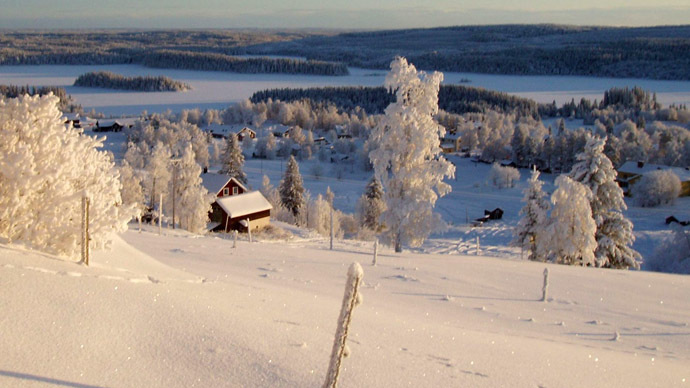 Grytan, located not far from the city of Östersund, has a housing center for those waiting for their application for asylum to be considered by the authorities. The center was the destination of some 40 people, who arrived in the village on Wednesday, but when they saw it they were not happy at all, reports The Local. "I am 75 years old and come from the Middle East. Then I get sent to a place that looks like this," a man from Syria told to the local Östersunds-Posten daily, pointing to the icy road. "It is dangerous for me to be here." The group refused to leave the bus and demanded that they were returned to Malmö, Sweden’s third city located in the south, or any other big city. The police were called on the scene, but they refused to evict the protesters. “We can’t force them off the bus. The case would have to go through the Swedish Enforcement Authority, which can issue an eviction order and only then can the police get involved,” officer Bengt Stadin said, Radio Sweden reported. Fredrik Bengtsson, a Swedish Migration Board spokesman, said that it was up to Swedish officials to choose where they would offer accommodation to asylum seekers. “We have seen cases where asylum seekers have certain ideas of what awaits them in Sweden and when that doesn’t match reality, then problems arise. They don’t feel what they see here meets their expectations. We’ve had a large amount of people come to Sweden this year and so we can’t place them where they want,” Bengtsson said. Asylum seekers are not prisoners and can live wherever they want after they are cleared to enter Sweden, but they would have to take care of their own accommodation themselves, he added. “We are in dialogue with these individuals, but we are very clear that this is the accommodation they’ve been offered and that if they don’t want it they have to arrange their own accommodation while their asylum applications are being processed,” Sophia Öhvall Lindberg of the Migration Board said. But the protesters say they feel cheated by the board as they were never told where they wanted to place them. "No one told us where we were going. Then we were told that we would be taken 40 minutes from Stockholm and in the end we had gone 15 hours," one of the man told Sveriges Radio Jämtland. The board said the Grytan housing center is now home for about 150 people. About a dozen of the protesters agreed to move in, while three others found their own housing. But about 40 people continued protesting and started taking turns to guard the bus, so that it didn’t simply leave them in the town. “We want a solution to this situation,” Öhvall Lindberg said. The standoff continued for two days. On Friday, the protesters finally agreed to vacate the bus after Swedish officials pledged to move them within three months. In 2014 Sweden took in its highest number of asylum seekers since 1992, when people fleeing the Balkans wars reached the Scandinavian country. A total of 81,300 people found refuge in the country last year, almost twice as many as 54,300 in 2013. The refugees come mostly from Syria, which accounted for 30,600 asylum seekers in 2014.